With its generic name and seemingly plain reel design, pokie fans may at first not think much of Casino Win Spin but you would be mistaken if you write this Nolimit City pokie off as just another bland title. This pokie pretty much reinvents what a modern fruit machine pokie can be and gives players a feature rich game which manages to still have a classic feel to it. Its 96.74% RTP pushes it well above its contemporaries available online. The 50 000 jackpot isn’t the biggest out there but it is a great incentive included that you won’t find on many fruit machines. Players can spin from as little as 0.20 per wager but you can increase the value of your wager coins to make bets as high as 100 across the 20 available paylines. The 5×3 reel design looks great on mobile and desktop devices thanks to NoLimit City making the reels fill most of the screen. The reel icons are familiar but they look fantastic on the 3D slot wheel that is used here to display the action. The bonus feature available with this pokie comes in a few shapes and sizes but none of them disrupt the feel of the classic fruit machine action. There are no free spins or bonus mini games, only the special wilds, the Hot Zone and the Spin Till You Win feature which all work together very well. 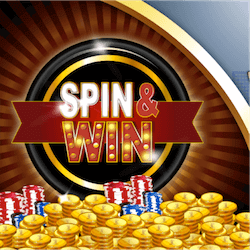 The most layered and rewarding bonus feature in Casino Win Spin is the Spin Till You Win feature. It triggers randomly and will guarantee you a winning spin in 3 steps. Firstly feature icons will all become wild after the first non winning spins. Secondly a multiplier will be activated ranging between 2x and 5 the winning payout. Finally if still no winning spins are formed, the feature will add an expanding wild on the third reel. In Casino Win Spin the 2nd and 4th reels are known as the Hot Zones. Here two matched symbols on each reel will activate the Spin Till You Win feature where the trigger symbols will now be completely wild. The same feature can triggered with wild symbols. The wilds will remain in place as sticky wilds while regular wilds will now become special expanding wilds. Casino Win Spin deserves the attention of all pokie players. If you have never experienced a classic fruit machine style pokie then this game is the perfect place to start.